Moonstone by Marilee Brothers – It's Time to Read! A sickly mom. A tiny house trailer. High school bullies and snarky drama queens. Bad-guy dudes with charming smiles. Allie has problems. And then there’s that whole thing about fulfilling a magical prophecy and saving the world from evil. Geez. Welcome to the sad, funny, sometimes-scary world of fifteen-year-old Allie Emerson, who’s struggling to keep her and her mom’s act together in the small-town world of Peacock Flats, Washington. An electrical zap from a TV antenna sets off Allie’s weird psychic powers. The next thing she knows she’s being visited by a hippy-dippy guardian angel, and then her mysterious neighbor, the town “witch,” gives her an incredible moonstone pendant that has powers only a good-hearted “Star Seeker” is meant to command. “Who, me?” is Allie’s first reaction. But as sinister events begin to unfold, Allie realizes she’s got a destiny to live up to. If she can just survive everyday life, in the meantime. I really enjoy young adult, fantasy novels. I loved the Twilight series, the Iron Fey series and I’m currently enjoying the Trylle series. This book had a lot of pressure on it, and I have to say, I really enjoyed it. 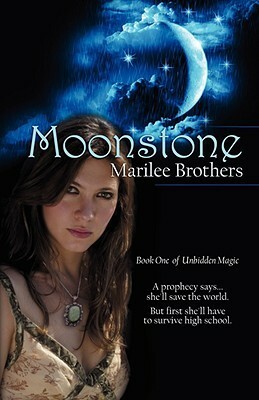 This is a review book from Netgalley and is the first book in the Unbidden Magic series by Marilee Brothers. The star of the book is Allie – a normal girl who receives magical powers after getting an electric shock. She has mind control powers – something she discovers when she stops a bull from trampling her just be thinking “please stop” in a panic. She is visited by a guardian angel, who seems more hippy than angel, who tells her of her power and about a prophecy. Later, she is given a beautiful pendant – a moonstone pendant – by her friend Kizzy. With it comes responsibilty and power – but also jealously and danger. She soon learns that people are greedy and will try and steal the stone; and some are evil, her arch enemies, who want the moonstone for disaster. She has to learn to fight, to use her power and to trust those close to her. This was a good book. I am reminded a little of Charlaine Harris’ Harper Connelly Series, where Harper is struck by lightening and develops physic powers. This novel has excitement, danger, humour and love. We have heroes and villians and a plot that is fast paced and engaging. Very quickly into the book key events happen – Allie received the electric shock and meets her guardian angel – and the story moves on and develops at a good rate. I didn’t lose interest in this book, it kept me reading as I wanted to know what was going to happen. I liked that there were other stories running alongside the main story of the moonstone. We learnt about Allie’s Mum and the life they were living. We saw how events changed her Mum and the attitude she had to life. We also met Allie’s Father, a man she knew nothing about and at the end of the book we learnt about the significance he is going to have in the following books. There is of course a love story as well. Allie meets Junior – an ex-gang member who has reformed his ways and is intent on looking out for her. I liked Allie. She was smart, quick-witted and when she needed to be, fearless. I loved that even though her Mum drove her insane, she was prepared to fight for her and their lives. I really liked Kizzy, a lady the children all thought was a witch. She was caring and loving towards Allie. I found Junior an interesting character. For an ex-gang member he was awwfully nice! I like a book with villians too – I like a book where the characters spark reactions from me, and this book had just that. I didn’t like Revelle, the guy who wanted to use the moonstone for evil and I didn’t like Carmel, Kizzy’s daughter, who wanted the moonstone for greed. Neither of them were nice and both of them bothered me! This was an enjoyable book and I will definiately be reading the next book in the series. This is a young adult fantasy novel which I really enjoyed. It was gripping – I wanted to know what Allie was going to face and how she would overcome things; I liked the characters – they were engaging, even if I didn’t like some of them; and it had everything I want in a book: excitement, adventure, a good plot and good characters. This isn’t a hard read but it was enjoyable. There were some things that were predictable, but it was a good read nevertheless and I’m looking forward to book 2! Thank you very much for taking the time to read and review Moonstone. I appreciate it!